Politics is usually the last thing that is on the average college student mind, but for many political science students, politics are a part of everyday conversation and agendas. While there are a lot of discussions and emphasis towards the Presidential Elections in 2016, the general public – particularly students – fail to realize that local elections are just important as well. Due to the lack of attention students show toward local elections, the University of West Georgia’s (UWG) Political Science Department joined together with the Political Science Club to host the Carrollton Mayoral Debate on Oct. 21 in Bonner Lecture Hall. The two organizations hoped the debate would serve to educate students about their role in the local political system, just in time for the City Carrollton elections on Nov. 3. The debate happened by the requests of students who wanted to be a part of the local political action occurring in the Carrollton community. In past years, political science professors or candidates running for office hosted debates at the university; this year, however, the tables turned and students took charge of planning and hosting the debates. The debate was held at UWG for two reasons: the first being that the university is the center of the Carrollton community and culture and has a significant relationship with the city government. The second and main reason for the debates, was to get students involved and learn more about the political process and how it affects them currently and in the future. 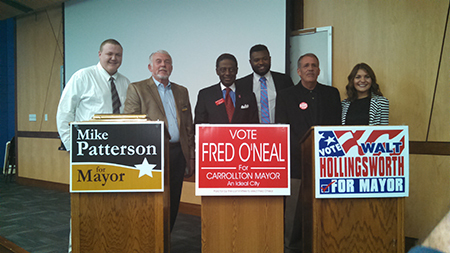 The debate consisted of three prominent Carrollton figures, Walt Hollingsworth, Mike Patterson and Fred O’Neal. This year’s race will be historic as O’Neal is the first African-American to run for the Carrollton mayor seat. A native of Dayton Ohio, O’Neal is a financial advisor for Edward Jones Investments in Carrollton and set to be the voice not only for the Carrollton community but for the city’s growing African American population as well. Three political science majors at UWG, Lans Carcioppolo, Troy Crittendon and Sarah Clanton, moderated the debate. The candidates were pressed on issues such Carrollton’s relationship with the university, resources for Carrollton City Schools, green space and business regulations. The debate is the first of many things the Political Science is doing to assist students in realizing that they are the leaders of today and tomorrow. It emphasize the importance of knowing current issues and maintaining a healthy relationship within the community.